MUST READ! Here you'll find the rules of the forum/chatbox, character information, etc. Here you can read news and updates from fellow members or staff. Check frequently. Here is where you can post random things and things that don't have to do with roleplay. 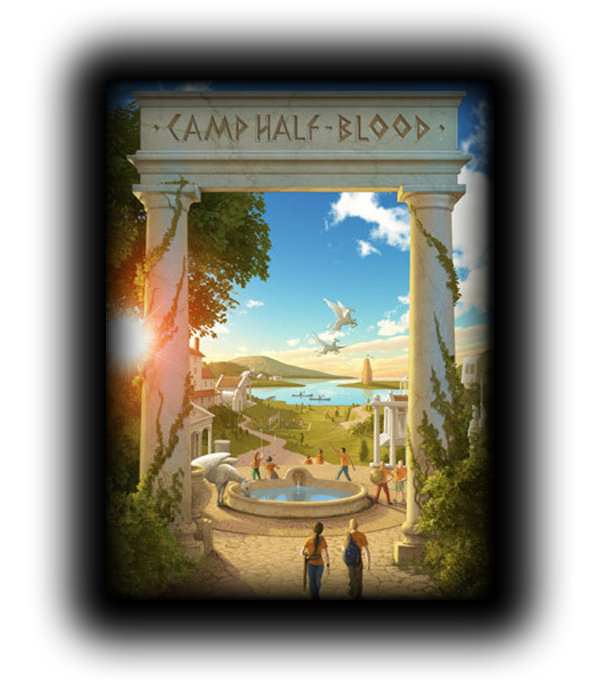 Half-Blood Hill is located near the entrance of Camp Half-Blood. The steep, grassy hill is one many half-bloods have to climb, often with monsters chasing after them. A top Half-Blood Hill is Thalia's pine. Thalia's pine was so named due to the fact that Thalia, Daughter of Zeus, was trapped inside. She is not there anymore, but the pine still stands proud and tall on top of Half-Blood Hill. Two tall, granite pillars stand tall and proud with a sign above that reads Camp Half-Blood. This sign is often a beacon of hope and a bright light for many weary half-bloods and satyrs. However, humans and monsters can not pass this spot. The Big House is just that...big. It is often the first stop for many new campers. Here you can find Chiron's Office, Mr. D's Office, The Basement, and The Attic, which contains many interesting items and is home to the oracle. Chiron is the friendly and wise centaur that runs the camp. Here is his office, and his door is open to all. The Basement was once the home to the children of the minor gods, however, they have recently convinced Hera to allow the campers to stay in her empty cabin. So now, the Basement remains empty, save for a few forgotten socks. The Attic, full of dusty and old memories from past quests and other significant events during the camp's history. It is also the home to the oracle and many wish to travel up to hear their prophecy. However, they do not always like what they hear. Mr. D, or Dionysus's, office. If for some off reason, you wish to venture into this office, it is located here. But why would you want to, after all? There are twelve Cabins in Camp Half-Blood all around the Cabin Courtyard. The cabins are were campers will sleep, meet their half-siblings etc. The Zeus cabin, Cabin 1, was once mainly empty. However, after more children of Zeus started appearing, it has gotten slightly more crowded. Decorated with many lightning bolts and storm clouds, this cabin seems to be truly electrifying. The Hera cabin, Cabin number two, is an elegant shade of white with engravings of peacocks along the sides. The windows, stained glass, illuminate the inside of the cabin with an array of hues. Hera has agreed, after a great bit of convincing, to let the children of Minor Gods and Hades reside in this cabin. The Poseidon Cabin, cabin number 3, is over looking the Lake. The outside is covered in paintings of underwater wife, waves, and is decorated with fishing nets. On the door is an engraving of a trident. Here is where the children of Poseidon stay. And it only smells fishy during the summer. The Demeter Cabin, cabin number 4, is very natural looking. It has vines, fruit and an actual tree running through it. The tree is located in the center of the cabin and its roots spread throughout each room. The Ares cabin is rather threatening and strong looking. With engravings of mighty battles along the walls and weapons hangings along the outside, the cabin certaintly reflects the personality and strong nature of the campers that live in it. Above the door is the head of a bull with horns that curl and give, once again, a strong look to it. The Athena cabin is a plain, marble white with paintings and engravings of different Greek sayings and owls. The door shines a golden hue and there is a bronze owl knocker on the front. The inside of th cabin, which is bathed in light from the stained glass windows, is full of shelves and cases of books. The cabin itself is very neat and tidy as well. The Apollo cabin is the largest, since Apollo has the most children. The outside shines in the sun and there are many large windows to let in the warmth and natural light of the sun. There is a large, solar like engraving on the door. Inside, there is always music playing. Any instrument you can think of is lined up against the cream colored walls. The Artemis cabin is usually empty, since only the hunters stay here whenever they come to visit. The outside is simple, with engravings of different animals and a silver moon in the center of the archway. The inside is just as simple, with exta bows and arrows stacked against a wall and bunk beds throught the sleeping area. The Hephaestus cabin looks like the smallest. It is made of metal with cranks, screws and wheels decorating the outside. However, on the inside, the rooms shift and the cabin continues underground. Being the tinkerers that they are, there are many hidden rooms that shift around when the specific word is given. The Aphrodite cabin is painted a pastel pink with reds and creams throughout it. There are engravings of doves and roses around the door way, which has an elegant archway over the top. The stained glass windows, which cast hearts and doves across the floor of the cabin, are tall and let in quite a bit of light. The inside of the cabin often smells strongly of designer perfume. The Hermes cabin is often the most full. If you are an unclaimed demigod, you live here until you are claimed. The outside of the cabin is a rich colored wood with a gold door. Above the door are a pair of winged sandals, the wings flutter when the door is open. Known for their trickery, the Hermes campers gave built underground tunnels to different places in the camp to make escaping easy. The Dionysus cabin is a pale granite with grape vines running all over the outer and inner walls. The vines bare grapes in spring and summer. The inside of the cabin has a fountain, except it's no normal fountain...it has wine in it rather than water. The wine is made by children of Dionysus and can only be tastes by children of Dionysus. However, some Hermes kids have tried to get a taste of it. The cabin courtyard, the center area of all the cabins. There is a large fountain in the middle of the square and granite stones make a walkway that leads all through camp. Many campers gather here and sit by the fountain. This is the place where food is eaten. Here you may sit with your cabin, or be the odd one out and dare yourself to sit with your friends in other cabins. Once you have finished your meal, give over your offerings to the gods. The Lake is one of the more popular places in camp. Many go there in the afternoon to swim, and some Poseidon children come to work on their control of water. Others will got here after hours as well, but beware of the harpies. Euros creek is a wonderful place to sit and think. Many will sit by the bank and dip their feet in the water. Euros creek runs off of the Lake and into the Long Island Sound. The Beach of the Long Island Sound. A great place to go tanning, sit and talk to friends, or practice your monster battling. Parties are often held here after hours, but make sure you don't get caught! The Stables, full of both winged horses, or pegasi, and regular horses. From the Stables is a riding track that is often used when people go riding of winged or none winged horses. Want to learn to ride a pegasus or even just a regular horse? Come here to get riding lessons and learn how to soar through the skies or how to gallop along the ground. The Horse Path is a dirt road that is often ridden upon by campers and their horses. At the end of the Horse Path there is a large, clear area that is great for taking off in flight on your pegasus. Do you need a sword, dagger, bow and arrow, or any other weapon? Go to the armory and place your order and the children of Hephaestus will contact your when your weapon is finished. Full of children of Apollo, the Infirmary is the first place you should go if you are seriously injured. You will be tended to and healed as soon as possible. This is the Arts and Crafts area. Make a picture frame, a friendship bracelet, or a statue of your godly parent here. There is a concert held at the Amphitheater every Friday evening. After the Apollo cabin performs some songs, there is an opportunity for Open Mic Night. Get up and sing your heart out! The Camp Store is full of all necessities since some campers get to camp empty handed. Pay in drachma or regular dollar and buy needed items or just things your find interesting. This is the area for sports, or sport like activities, to be performed. Go here if you're in need of a place to burn off steam, play a good game of volleyball, or train to fight. Here you can play Volleyball with other campers or even a few satyrs. However, this is no normal game of Volleyball. The courts rise and fall as you play, so be careful! Want a place to get a challenge, get in shape, or even lose a limb? Go to the Climbing wall! There you can use your skills of climbing, fighting and avoiding obstacles to make your way to the top. The Arena, a place full of campers almost all the time. Have target practice with your bow and arrow, fight a straw dummy, or have a friendly battle here. There is one Chariot race held every other month. Race around the track, use your chariot to try and take out other teams. However, be warned, many of these races can get violent. The Strawberry fields stretch across a large area and are full of sweet smelling strawberries. Many children of Demeter, Dionysus, and other agricultural deities go here to farm and garden. The Forest is both a place of beauty and mystery. There are a few monsters that have been unleashed into the forest for battling purposes, so be aware of your surroundings. Many campers go into the front part of the forest, but only the brave venture beyond the tree line. Zephyros creek runs through the forest. It is the line of games for capture the flag and is alone a good place to go and relax. A game of Capture the Flag is held the first Sunday of the summer term of camp. Cabins team up to try and locate the flag of other the other team and win the game. Helmets and armor are suggested. Leaving for the school term, visiting home, or just sneaking out? Here is where you can go if your are leaving the camp for whatever reason. But beware, there are monsters out there. Finished threads and topics go here.